Today we released Bound To Light version 0.2.0, hype! Weâ€™ve been listening to feedback from various sources on how to improve the game, hereâ€™s a list of the things weâ€™ve done, donâ€™t worry, no spoilers. Enemy behaviour is more consistent and less punishing, no more beasts teleporting through walls! Lux will attempt to defy the laws of physics less often when falling from ledges, although it was kind of cool to look at in the end we did not want it in the game. Weâ€™ve done some tweaking to the visual style of the majority of the puzzles, this includes new assets & updates visual effects. Updated some animations, added some new animations. More spooky ambient sounds throughout the game. Updated sound effects, added new sound effects, just listen to that swap! Weâ€™ve re-designed almost all of the puzzles in the game, these changes vary from minor clarification changes to complete re-designs, try it out and see for yourselves! Some doors have been replaced with barred doors, this change was to make it easier to see what will happen when certain doors are opened. Added new runes that appear in puzzles, see if you can figure out what they mean! Lux can no longer throw rocks. This feature was something that we initially thought would be a great addition but ultimately did not fit in with the rest of the game (it also made development of enemies trickier), therefore we decided to not keep it in the game. You can now look around with the camera using right-stick on controller or moving the mouse when using keyboard and mouse. This changelog could be much longer, but as mentioned above we do not want to spoil the game for you! 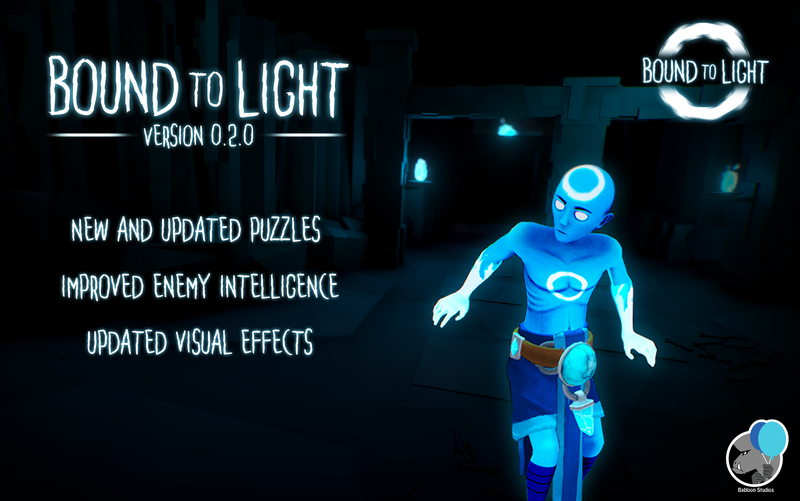 So without delaying you further, go ahead and give Bound To Light 0.2.0 a try! Sadly this is also our official feature-stop for a while, but donâ€™t worry, weâ€™re still listening to feedback and fixing bugs! Now go save some souls!